Christmas is not far now. It’s only matter of days to finalise the preparations for your Christmas party. We understand that the event planning is a very stressful. A lot can go wrong. And you have to look upon every minor detail to pull a perfect party. And a tiny miss can ruin your celebrations. Well we cannot help you with everything but we sure will do what we can. So if you are serving pizzas to your attendees and wants to have custom themed pizza packaging boxes to demonstrate your feelings or promote your business, we can take this load off your shoulders. 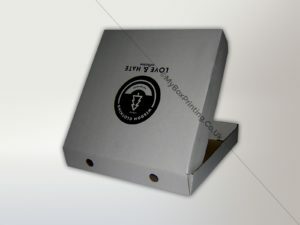 We are a pioneer when it comes to manufacture personalised pizza packaging boxes. Contact our sales team with your box details and we will contact you back with a price. Once you have finalised your design, you can relax from one biggest worry of your planning and be sure that you will get what you have demanded for with a good discount.